Calcium score - Also called Agatston score, measures the amount of calcified plaque inside the coronary arteries. Higher the calcium score, the higher the chance of heart attack. Excellent predictor of future heart attack risk. Computed tomography (CT) or electron beam tomography (EBT) - used for imaging heart. Scans provide a calcium score? Atherosclerosis - When artery walls gradually filled with plaque (cholesterol, inflammatory cells, scar tissue). Different kinds of plaque. Heart attack caused when soft cholesterol rich plaque bursts, resulting in blood clot. Blood clot blocks blood flow to heart. News to me. I thought plaque, not a blood clot, that caused artery blockage and heart attack. But this clot model makes sense, given sudden nature of heart attack. A slowly developing plaque blockage should give the heart time to grow collateral vessels. Better model of heart attack - Heart attack not caused by plaque blockage in the tube of the vessel (old school). The culprit is plaque depositing in the inner lining of vessel walls, like pimple filled with cholesterol. When pimples bursts, an injury site is created. To heal the injury, a clot will form. If the clot is big enough, it blocks the artery, causing heart attack. Cardiologist Ted Feldman, M.D. shares his conversion from intervention to prevention. Lower is better. Lower blood cholesterol (except HDL), lower blood sugar, lower blood pressure. 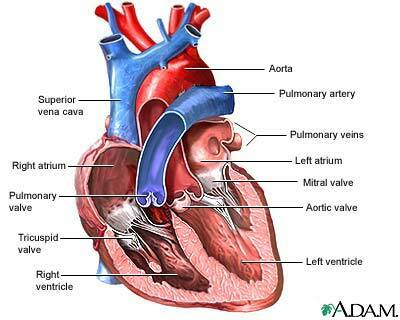 How the heart works - The heart is a pump with four chambers, two upper and two lower. The upper, atrium chambers are small. The lower, ventricle chambers are larger. Oxygen-starved blood enters the right atrium via the superior vena cava vein. The right atrium pumps the blood to the right ventricle, which then pumps the blood to the lungs via the pulmonary artery. After passing through the richly vascularized lung tissue, oxygen-rich blood return to the heart via the pulmonary vein and into the left atrium. The left atrium pumps the blood to the left ventricle, the launching pad that pumps the blood through the huge aortic artery and delivers blood to the rest of the body. How the heart is fed - The heart feeds itself first. Just outside the left ventricle, a short way up the aorta are the branches of the coronary arteries. The three main ones: LAD, LcX, RCA. The dieter's creed that "all fats are bad fats" is NOT true. Yes, saturated fats and trans fats are BAD. They cause changes in the blood chemistry that increase bad cholesterol and encourage plaque buildup. However, monounsaturated and polyunsaturated fats are GOOD. Both mono- and polyunsaturated fats cause changes in blood chemistry that discourage inflammation of arterial vessels and reduce plague buildup and bad cholesterol. Further, fats in the diet signal the brain to give you a full or satiated feeling. Without the fats, you don't get that full feeling and keep eating. One reason high carb/low fat diets lead to weight gain (though there are other more important reasons). When dieters mistakenly believe all fats are bad, they typically seek out high-carb foods, thinking "all carbs are good carbs." Again, NOT true. Processed carbs lead to sharp increases in blood sugar, which tells your pancreas to produce rush of insulin, leading you to "crash." On the other hand, UN-processed carbs DO NOT lead to a sharp rise in blood sugar and a reactive spike of insulin. Indeed, whole grains, many whole fruits, and whole vegetables avoid the sugar spike because the sugars and carbs are absorbed slower due (largely) to the fiber in those foods. This leads to slower rise in blood sugar, and this slower rise is handled much more easily by the insulin producing pancreas. So almost all whole foods are GOOD. In general, unprocessed foods do not cause the insulin rush of processed foods. Lipoprotein subfraction test - Examines the size of LDL and HDL molecules. Small is bad (for both LDL and HDL). Small LDL molecules are better able to deposit soft plaque in artery wall. Small HDL is less efficient in cholesterol cleanup. Lipoprotein (a) test - Levels above 30 mg/dL of this little a molecule, which attaches to some LDL molecules, indicates higher risk coronary artery blockage. High-sensitivity c-reactive protein (hs-CRP) test - High levels indicate general inflammation in the body, a damaging condition for arteries. 1 mg/L or less is good. 1 mg/L to 3 mg/L is average risk. Above 4 mg/L is heightened risk. Homocysteine test - Levels above 12 umol/L indicate higher risk for vascular disease. Heart scan (for coronary artery calcium number, Agatston number) - Through a heart scan, measures the calcium deposit levels in coronary arteries. 1 100 is low to moderate. Above 100 to 400 is increased risk. Above 400 is very high risk.